In the past few years there has been a shift in the way audiences consume television. Channels have recognised there is a progression towards more of a binge-watching approach of focused, shorter seasons of television. Such networks have had to either pivot and acknowledge this growing trend, while others have been fortunate to have already embraced this culture and continued to do so. According to the information presented here, NBC is a virtual abattoir of televisual entertainment. The Peacock has cancelled 90 percent of its scripted shows in the last five years and has the most “one-season wonders” of any network. Meanwhile, Showtime has only had two such short-lived shows in the same time period, and CBS has the best track record for returning series. 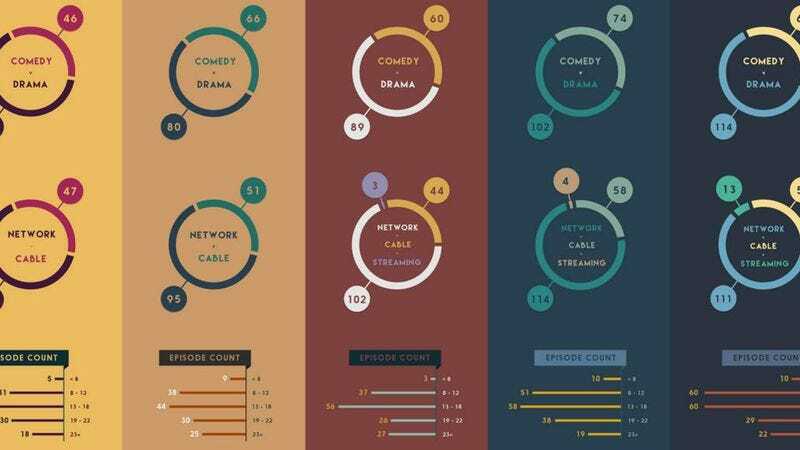 Across all channels, dramas have consistently outnumbered comedies, but sitcoms were steadily on the rise from 2010 to 2014, when they started tapering off again. And while cable and streaming have both carved out places for themselves in the television viewing landscape, the networks still command most of the real estate.